When Today’s Dietitian posted news about the ruling on its Facebook page shortly after the rule was announced, comments poured in, and readers didn’t hold back with remarks ranging from outrage to encouragement. Some saw the inclusion of other nutrition professionals as an affront to dietitians’ authority and criticized the Academy of Nutrition and Dietetics (the Academy) for not adequately supporting its RDNs. Others saw the potential influx of non-RDNs in the hospital setting as nothing more than friendly competition that could encourage dietitians to up their game—with patients benefitting from the superior service that such competition can offer. While opinions ran the gamut, one common question surfaced: Just what is a “qualified nutrition professional” and who determines such? To get to the bottom of this ruling—and to whom it actually applies—as well as what it means for dietitians and the greater dietetics community as a whole, Today’s Dietitian reached out to nutrition-credentialing organizations and experts (both dietitians and non-RDNs) to get the pulse of this hot-button issue. As noted below, the final rule states that dietitians and other qualified nutrition professionals are now eligible to write therapeutic diet orders independent of a physician order. 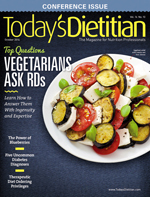 “The CMS final rule would save hospitals significant resources by permitting registered dietitians to order patient diets independently, which they are trained to do, without requiring the supervision or approval of a physician or other practitioners,” says Rene Ficek, RDN, a dietitian who’s also the lead nutrition expert at Seattle Sutton’s Healthy Eating. However, to obtain these rights, a hospital must grant individuals these privileges based on a medical staff recommendation. “Not every nutrition professional or every dietitian will automatically be able to write independent orders,” says Michael Stroka, JD, MS, CNS, LDN, executive director for the BCNS, the organization in charge of certifying the certified nutrition specialist (CNS) credential. “The ruling clears the way for hospitals to appoint certain nonphysician providers, including dietitians and [other] nutrition professionals, to medical staff without jeopardizing the hospital’s Medicare/Medicaid reimbursement,” Stroka explains, noting that the law doesn’t require any hospital to make such appointments, and all appointments must adhere to state law. Stroka further explains that this ruling includes two other provisions especially important for nutrition professionals. One relates to ordering labwork and says dietitians or other qualified nutrition professionals (who are privileged) can be granted the right to order labwork that assesses nutritional status or response to dietary intervention. “But this right is not automatically mandated by the ruling,” he says. Moreover, he notes that the ruling allows for those qualified to provide and bill for telehealth services under specific circumstances and related to underserved areas. Dietitians aren’t the only ones feeling that sentiment. Rao Ivaturi, PhD, CNS, director of the Nutrition Center for Disease and Weight Management in Indiana, also believes this ruling is long overdue. “It allows for nutrition experts who are trained to investigate and establish causal relationships between nutrients/diet and disease to participate in the dissemination of that firsthand info to patients,” he says. “Hitherto, patients did not have access to that wisdom. The Academy also is applauding this new rule and what it will mean for health care efficiency gains. In a news release following the announcement of the final rule in May, then Academy President Glenna McCollum said the following: “CMS’ new rule will eliminate burdensome and superfluous regulations that are adding to our nation’s health care costs. Allowing registered dietitian nutritionists to independently order therapeutic diets and monitor and manage dietary plans for their hospital patients will save the country hundreds of millions of dollars and also help hospitals provide better multidisciplinary care.” Streamlining the health care process, the news release indicates, allows practitioners to focus on providing patients the highest quality of care. Today’s Dietitian contacted the Academy for a statement concerning the inclusion of non-RDNs in the final rule and what this might mean for its members and the dietetics profession as a whole, but they declined to comment. Based on statements in its press releases, the Academy is focusing on ways its members will benefit from these new privileges. For Academy members looking for specifics on how they should proceed with obtaining these privileges, the organization offers helpful resources and FAQs about the ruling on its website. While the new ruling seems to be a clear win for qualified nutrition experts, the original questions remain: Who is a qualified nutrition professional? And should any credential outside of the RDN be considered qualified for such hospital privileges? Basically, the hospital and state decide who is qualified. The language of the final ruling, while it clearly extends these privileges beyond dietitians, doesn’t define what makes a nutrition professional qualified. So can anyone call herself or himself a qualified nutrition professional? It’s possible, since anyone can launch a website and provide nutrition advice with little to no credentials to back them up. However, that doesn’t mean a person without valid credentials will be seen as qualified by any hospital or even any state. While it remains to be seen just how a qualified nutrition professional will be defined, it will be hospitals and states that will be doing the actual defining (and vetting) of potential nutrition personnel. For RDNs who may feel the Academy didn’t go to bat for them, it should be noted that the Academy did request that the CMS give only RDNs the right to provide the hospital services specified in the ruling. In the end, however, the CMS rejected that request, opting for a more inclusive approach. So this rule applies to all nutrition professionals who are individually privileged by the hospital in which they work—with any diet ordering privileges applied to their work in those hospitals only, Stroka says. The second question, regarding which credentials make an expert qualified to give nutrition advice, remains subjective. A spectrum of nutrition credentials exists today and arguably the RDN credentialing standards may not be the most stringent of them all. The American Nutrition Association lists on its website the requirements necessary to attain a handful of the most common nutrition degrees sought today. Three distinct nutrition credentials require extensive coursework, internships, and an exam, the RDN among them. In addition to passing an exam, the RDN credential requires a four-year bachelor’s degree with 900 to 1,200 hours of experience accrued through a dietetic internship. The CNS credential involves passing an exam administered by the BCNS and completing a 1,000-hour internship program, yet instead of a bachelor’s degree, it requires a master’s or doctoral degree and advanced nutrition training. To become a certified clinical nutritionist (CCN), one must attain a four-year bachelor’s degree, 900 hours of internship experience, 50-plus hours of postgraduate study in clinical nutrition (or a master’s degree in human nutrition), and pass an exam administered by the Clinical Nutrition Certification Board. There also are much less-intensive paths to acquiring nutrition credentials, such as the certified nutritional consultant (CNC), which can be attained after completing one open-book exam, or the certified nutritionist (CN) credential, which requires passing an exam after a six-course program. With the ruling deferring to state and hospital guidelines, Stroka admits that the specifics of exactly how this ruling is applied across the health care spectrum remains to be seen, but he says the BCNS already has received calls from hospital administrators looking to fill nutrition positions since the ruling was announced. Stroka may feel confident that the language of the final ruling will effect only positive outcomes, but there’s some apprehension among a subset of RDNs of what’s to come. “My main concern is interpretation of the ‘qualified nutrition professional,’” says Gina Jarman Hill, PhD, RD, LD, coordinated program director and an associate professor of sciences at Texas Christian University. “Those providing care in the hospital settings still must meet the state requirements. However, in states where RDs are not fully recognized to the extent that they should be or if for some reason RDs lost their foothold in a state, then in theory the hospital doors could open to those other nutrition professionals who were not rigorously qualified to provide nutrition care in a hospital setting. RDNs aren’t the only ones with concerns, albeit different ones, regarding this ruling. Meryl Gorge, MS, CNS, a nutrition specialist in Indianapolis, has read the expanded language that includes non-RDN professionals in the final rule—but she’s not holding her breath for any new hospital opportunities just yet. As a non-RD with an extensive background in nutrition, Ross says hospitals and patients would benefit from employing knowledge and dietary plans from a variety of professionals. “Nutrition should not be treated any differently than the rest of the medical world,” she says. “There are MDs, PAs [physician assistants], RNs [registered nurses], NPs [nurse practitioners], and other health care professionals who provide very specific services and expertise to the patient. Likewise, there are nutrition professionals, such as CNSs and RDs, who provide varying levels of care for the patient. We should be embracing the idea that we can all work together and learn from each other in order to best help the patient. Ficek has high hopes for what this ruling will mean for RDNs in particular and patients as a whole. “With this change will come the advancement of the dietetics profession and a higher respect from other clinical professionals,” she says. “As dietitians are able to be more clinically involved with ordering therapeutic diets and monitoring patient tolerance via nutrition-specific labs, the quality of patient care will improve. And as quality of care improves, Ficek says, so do outcomes, which could then increase the need and demand for more clinical dietitians. “I believe this ruling to be just the start of something wonderful,” she says. A trend is building in the dietetics field: More opportunities are becoming available for a wider range of nutrition professionals to provide counseling services state by state. On the heels of the recent Centers for Medicare and Medicaid Services final rule, which allows all qualified nutrition professionals to have the same hospital privileges as RDs, Rick Snyder, Michigan’s governor, signed legislation to repeal the state’s licensure law that prevented a broad range of nutrition professionals other than RDs to practice individualized counseling. According to Michael Stroka, JD, MS, CNS, LDN, executive director of the Board for Certification of Nutrition Specialists, the organization in charge of certifying the certified nutrition specialist credential, the now-repealed Michigan law enabled all RDs to automatically be licensed by virtue of being an RD and applying for licensure, while no other nutrition care providers would qualify unless they pursued training based on the dietetics’ model. “All other [non-RD] nutrition professionals unable to obtain licenses would have been barred from meaningful nutrition practice,” he says. Stroka says this repeal will provide the opportunity for RDs and all nutrition providers in the state to compete on a level playing field, “and continually improve their skills and services to succeed in a competitive market for nutrition services.” It’s about providing the public the choice of whom to consult for any range of nutrition services—something he says the overwhelming majority of people prefer. • repeal existing laws that heavily favored licensure of RDs over non-RDs. “None of these states passed a bill to increase barriers to entry for nutritionists with non-RD credentials,” says Stroka, who also referenced an Illinois law that was amended in 2013 to recognize a broader pathway inclusive of credentials other than the RD. Such legislation isn’t about downgrading the RD credential, Stroka says, but ensuring an environment that doesn’t create barriers for those trained outside of dietetics. “Even if a nondietitian nutritionist is allowed to practice, the inability to attain a state credential when one exists can be an obstacle to qualified practitioners from having their services covered by insurance,” he says. While Huynh admits and appreciates that the nutrition field offers many opportunities for people to practice in a variety of settings, she emphasizes that appropriate training is imperative to providing safe, effective care. “RDs and RDNs will want to ensure that their patients and clients are receiving the expertise and care they need and deserve,” she says. And according to Huynh, that starts with knowing that all qualified nutrition professionals are just that—qualified to the tune of having patients’ best interests in mind along with sufficient clinical experience and expertise to provide competent care.